There have been 126861 visitors (356541 hits) on this page! Malta will join countries all over the world to celebrate the 400th anniversary of the discovery of the telescope and the 40th anniversary of the first moon landing. 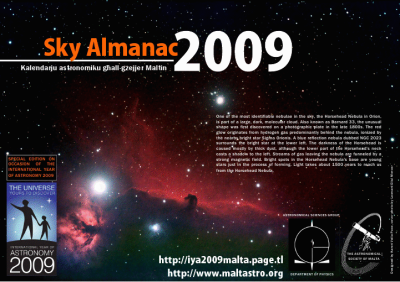 This is a unique opportunity for Maltese astronomers to unite with astronomers around the world. We will also take astronomy to the public and involve them in the marvels of the universe. We will also involve schoolchildren, hoping to interest them in astronomy and science and perhaps encourage them to take up a career in science which is so important for our country.